The craft beer pretzel ring will be the first of its kind in the market, taking inspiration from the Classic Pennsylvania Dutch sourdough recipe. With the unexpected flavors of malted barley and hops, the sourdough pretzel ring is another “unique” pretzel product that is breaking industry standards. Unique Pretzel’s Sourdough Craft Beer Pretzel Rings are called “craft beer pretzels” because through history sourdough twisted pretzels have been referred to as beer pretzels. The “craft” comes from the inspiration of brew masters that have used their talents to disrupt an industry and create an entire craft beer market. That inspiration is why Unique threw a dash of hops into the recipe as a tip-of-the-hat to those who know how to reinvent greatness. 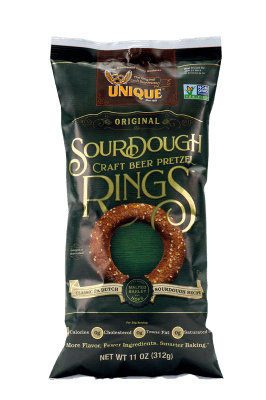 Unique made these Sourdough Craft Beer Pretzel Rings with only the finest ingredients and are Non-GMO, vegan and kosher with no added preservatives or flavors, continuing the standard of quality in all Unique Products for over 97 years.